The F/V OCEAN PEACE was originally built as the AMFISH, one of the first modern catcher/processors built in the United States. The steel-hulled vessel was constructed in 1984 at Moss Point Marine in Escatawpa, Mississippi as a dedicated freezer trawler for the East Coast squid fishery and, at the time, was the largest catcher/processor vessel on the East Coast. Ocean Peace, Inc. was formed in December 1990 and purchased the AMFISH in February 1991. The vessel then underwent seven months of retrofitting at Tippett Marine in Seattle and began fishing the North Pacific in August, 1991. The retrofit included state of the art equipment for the head and gut fishery in the Bering Sea, Aleutian Islands, and Gulf of Alaska. Special emphasis was given to the freezing system, which has a capacity of approximately 100 metric tons per day. The vessel has received many upgrades over the years including a completely new on-board factory in 2007. The OP’s latest renovation was her sponsoning at Vigor Marine in Portland, OR -- widening of the entire vessel from the keel to the upper deck. The improvements dramatically increased fuel and cargo hold capacity while creating increased operational stability. Prior to the sponsoning, the vessel measures 220’ in length, 36’ beam and 1,144 GT. Currently, the vessel measures 220’ in length, 50’ beam and 1,600 GT. 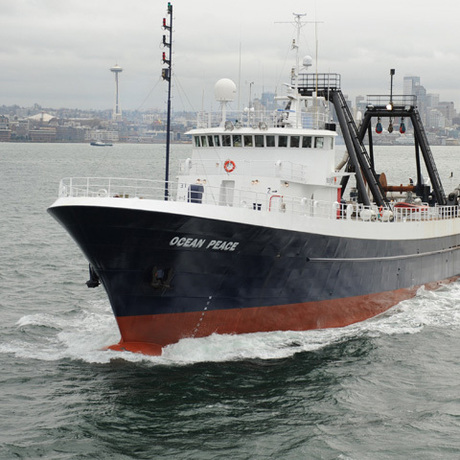 The F/V SEAFISHER was purchased by Ocean Peace Inc., on December 29, 2011. The vessel measures 230’ in length, 40’ wide and over 1,400 GT. The F/V SEAFISHER was originally built as the M/V Savage, an oil industry off-shore supply vessel. The vessel was constructed in 1976 by Halter Marine Services, Inc., at Moss Point, Mississippi. In 1990, it was converted into a catcher/processor by Tohoku Dock Tekko in Shiogama, Japan. The M/V Savage was then renamed F/V SEAFISHER. In 2012 the vessel underwent major renovations in the factory as well as improved amenities for the crew members. After the upgrades, the vessel will be able to produce over 100 tons a day of finished product. 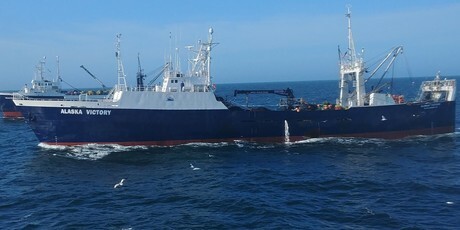 The F/V ALASKA VICTORY was purchased by Ocean Peace, Inc. in February 2017. The vessel measures 225’ in overall length, 40’ wide and over 1,610 GT. The F/V ALASKA VICTORY was originally built as an oil-field supply vessel. The vessel was constructed in 1975 by Quality Equipment, Inc. in Houma, Louisiana. It was later converted to a catcher/processor by Murakami Zosensho Shipyard Company in Ishonomaki, Japan in 1990. After its purchase by Ocean Peace, Inc. in 2017, the vessel underwent significant renovations in the factory as well as improved amenities for the crew members. 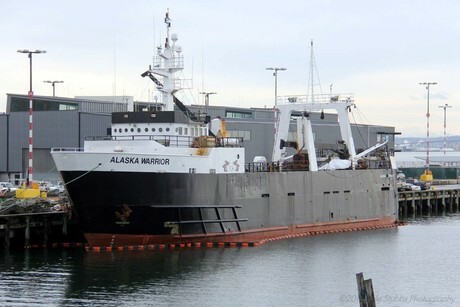 The F/V ALASKA WARRIOR was purchased by Ocean Peace, Inc. in February 2017. The vessel measures 215’ in overall length, 40’ wide and over 1,578 GT. The F/V ALASKA WARRIOR was originally built as the M/V STATE JUSTICE a supply vessel. The vessel was constructed in 1978 by Bourg Dry-dock and Service Company in Bourg, Louisiana. in. It was later converted to a catcher/processor by Bender Shipyards in Mobile, Alabama in 1989. It was then that the vessel was renamed F/T ALASKA WARRIOR. 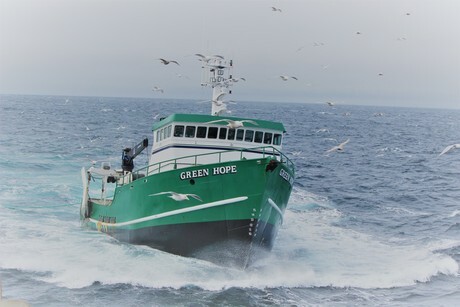 The F/V GREEN HOPE was built in 1979 at Master Marine, Inc. located in Bayou La Batre, Alabama, a shipyard which is owned by the Ocean Peace, Inc. parent company, US Marine Corporation. It was built as a 98' catcher vessel and fished in the Gulf Of Alaska, delivering to shore side processors till 2001. 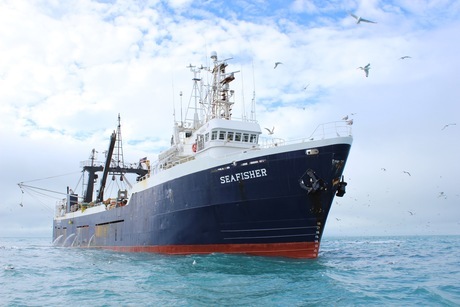 It was then docked in Seattle till 2014 when it was completely overhauled and refurbished and now fishes in the Bering Sea and the Aleutian Islands in cooperation with the factory trawlers F/V OCEAN PEACE and F/V SEAFISHER.